Efficiency and performance come standard, whichever engine you choose. And with technologies like Direct Injection and stop/start technology, you’ll want to take the long way in Impala. 2.5L 4-CYLINDER ENGINE is equipped with Stop/start technology and has an EPA-estimated 22 MPG city/30 highway. AVAILABLE 3.6L V6 ENGINE gives 305 horsepower, Direct Injection, Variable Valve Timing, and gets an EPA-estimated 18 MPG city/28 highway. 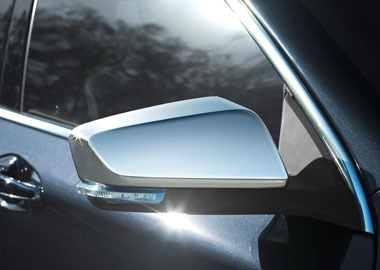 The 2017 Impala LTZ sports heated power-adjustble mirrors with memory settings. 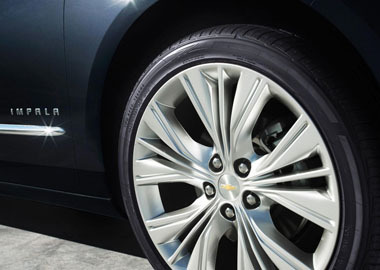 Stop shows and spin heads with 20-inch aluminum wheels, available on the 2017 Impala. Detailed contours on the outside give the Impala an athletic stance that you can’t help but notice. At night, the Impala Premier interior greets you with soft ice-blue ambient lighting that sweeps across the width of the dual-cove instrument panel and onto the front doors. The Internet’s along for the ride with available built-in 4G LTE Wi-Fi®. And with the standard 8-inch diagonal Chevrolet MyLink touch-screen display, you can send and receive texts, play music and more. 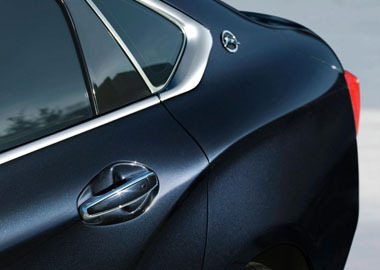 An athletic, contoured exterior exudes confidence. Inside, chrome and woodgrain accents provide a premium setting to experience the road. And with seating for five adults, everyone’s invited. Find that perfect driving position with available 8-way power-adjustable front seats featuring power lumbar control. With high-strength steel forming a rigid structure around the passenger compartment and 10 standard air bags, Impala establishes a solid foundation for safety.